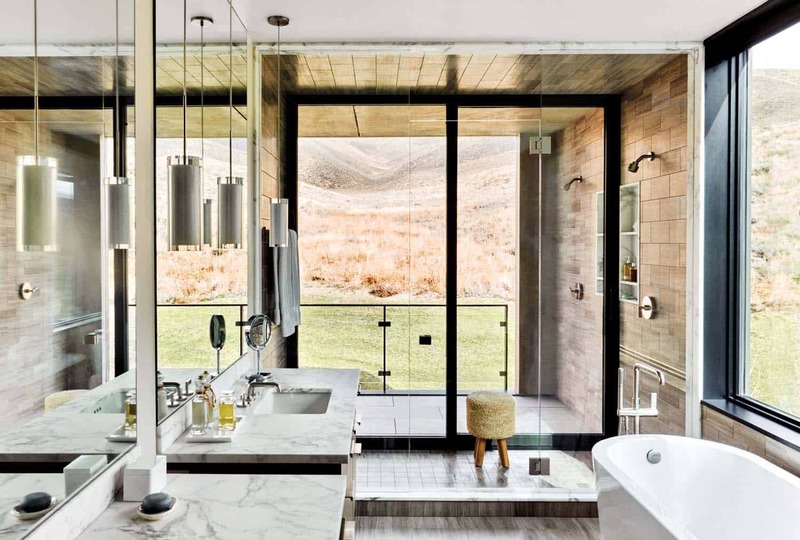 This art-filled mountain getaway was designed by Scape Design Studio in collaboration with Susan Marinello Interiors, located in Sun Valley, Idaho. With majestic natural surroundings, this weekend home offers a relaxing respite for the homeowners, one of which is an art gallery owner. 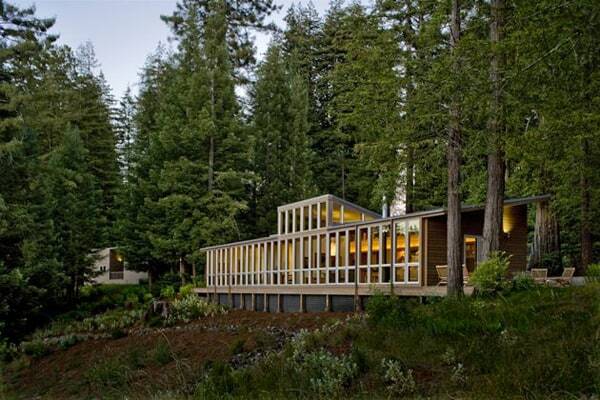 The owner’s purchased this home, which was built in the 1980’s, after seeing just the exterior. 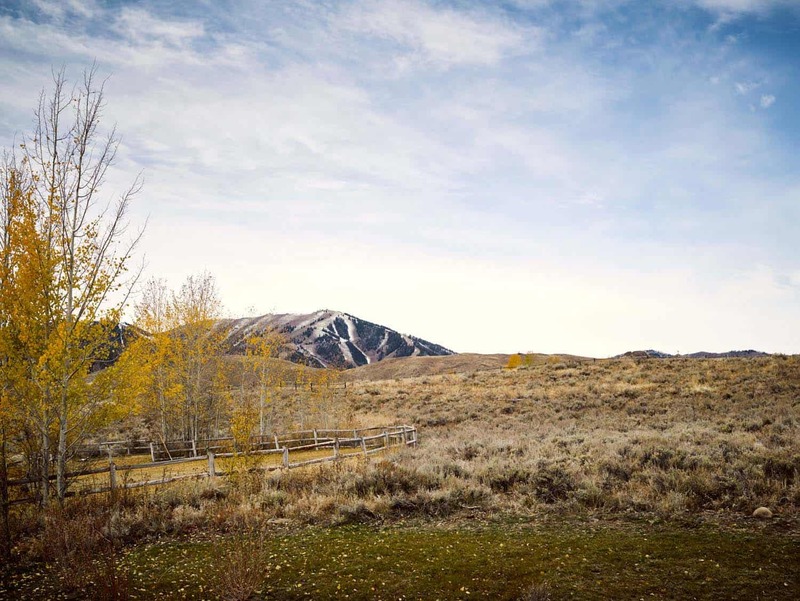 It was the rugged beauty of the property that caught their eye, mature aspens and pines, sprawling terrain and jaw-dropping views. Although they loved the property, the home itself was less than ideal for the couple and their two young children. 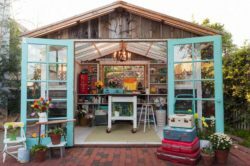 They decided it was time to build from scratch, creating a 6,000 square foot, four-bedroom home. 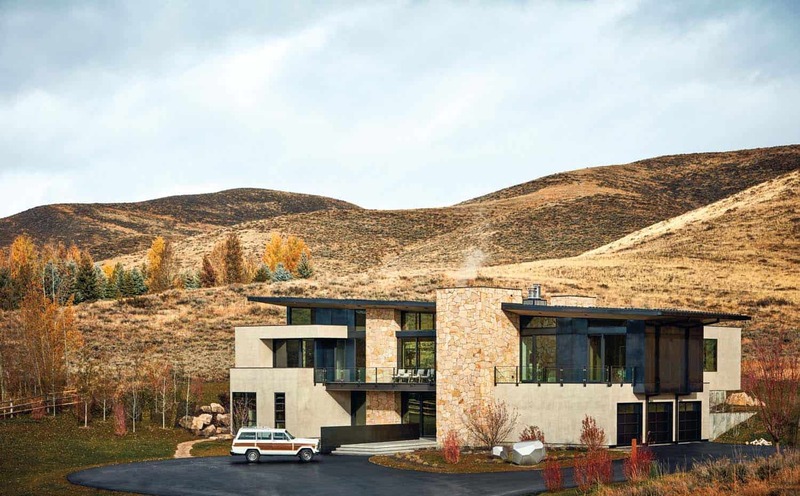 Rugged yet refined, the residence is composed of concrete, Utah buff stone, blackened steel, and expansive walls of glass to maximize the views. 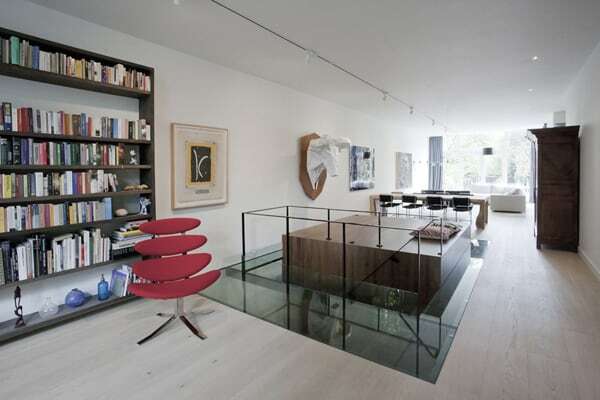 The owners wanted the design to be simple yet sophisticated, it was all about the materials and the breathtaking views. Above: Boulder-like stainless-steel sculptures by Julie Speidel are set out front of the house. 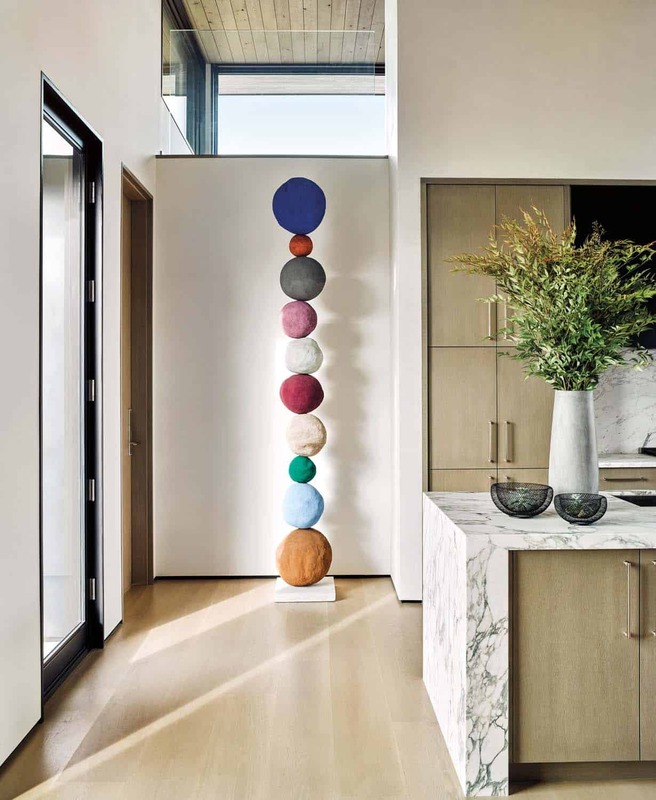 Above: A colorful stack of bronze orbs by Annie Morris towers over the kitchen. Throughout the interiors, art has been made a focus without having it take over. A lot of the works on display can also be found at the homeowner’s gallery. 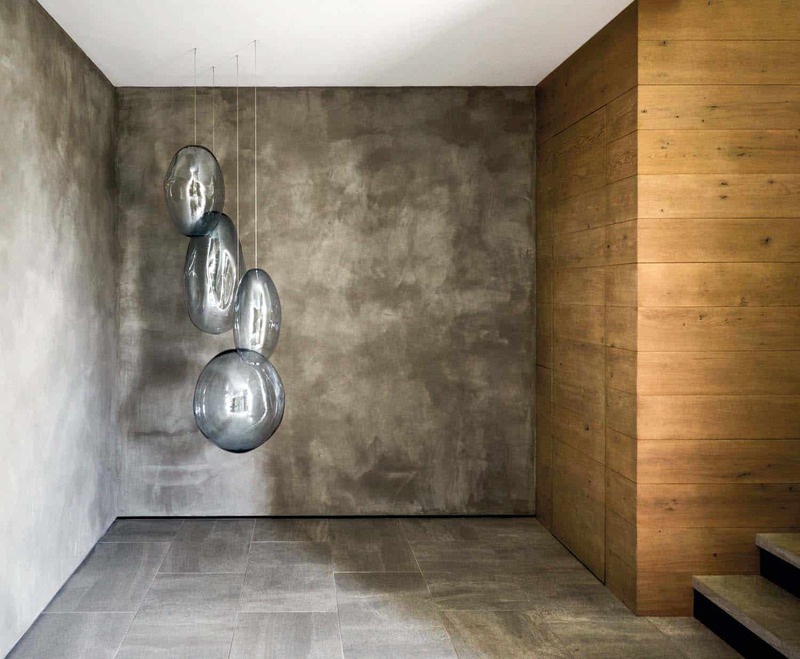 The interiors feature pale oak ceilings and floors and accent walls of wood, stone, and earthy plaster. 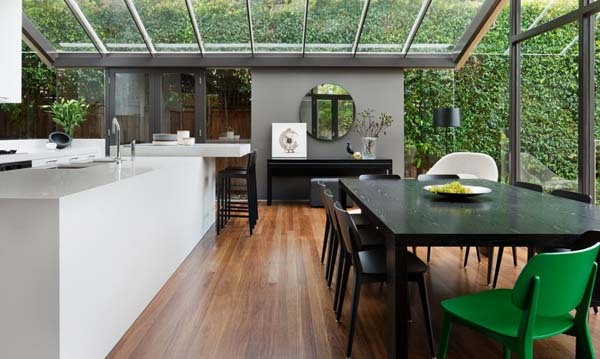 Above: Floor-to-ceiling windows helps to maximize the views and blur lines between indoors and out. The 14-foot-long dining table was custom crafted by Idaho-based TaylorMade Woodworks. It is composed of walnut-slab and provides plenty of space for entertaining. 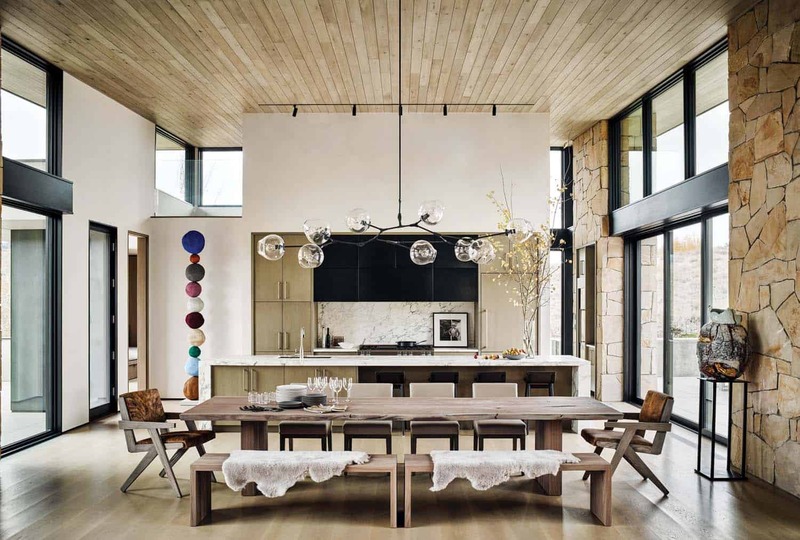 The table features end chairs by Jiun Ho, with accent chairs from Restoration Hardware and walnut benches custom designed by Taylor Woodworks. Illuminating from above is the 9-globe branching chandelier by Lindsey Adelman. 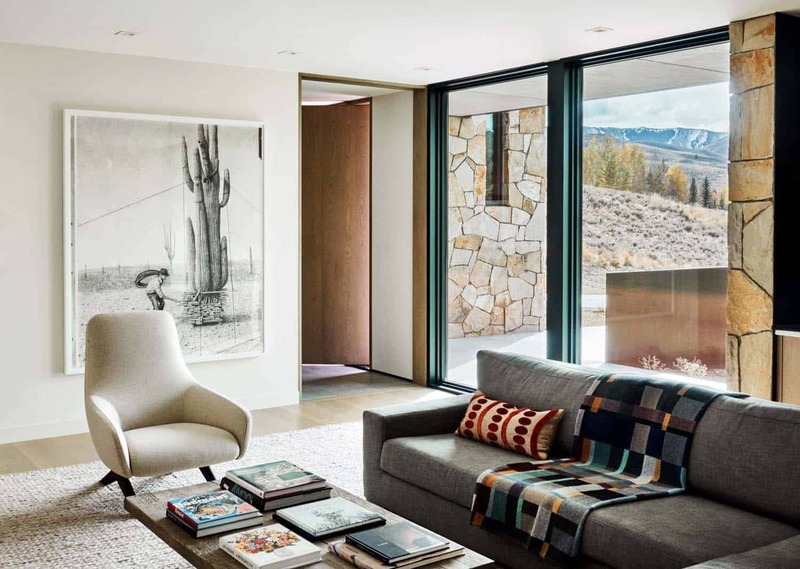 What We Love: This mountain getaway offers stylish living spaces complimented by artwork that offers moments of surprise and pop. 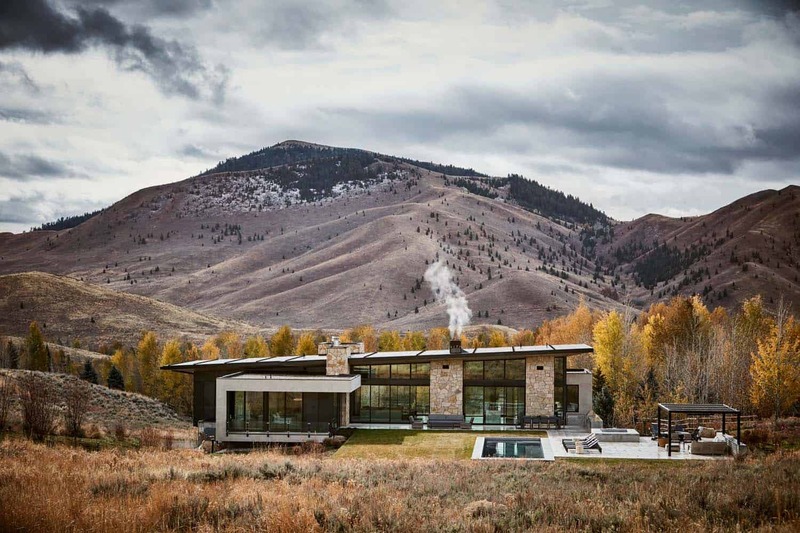 Walls of glass provides expansive views of the rugged landscape that surrounds this beautiful home. 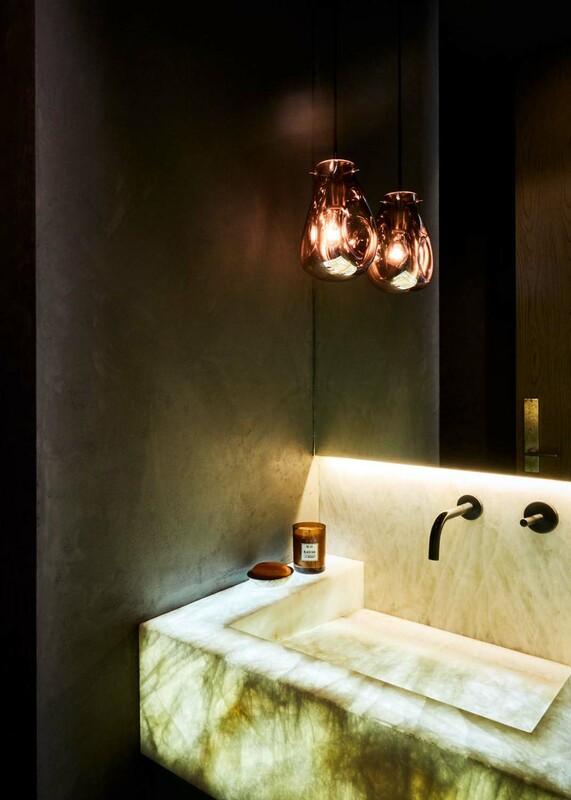 Although luxurious and elegant, there is a surprising amount of warmth thanks to the use of stone and wood. 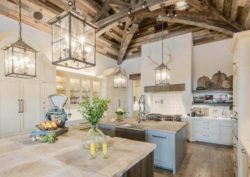 We are especially loving the kitchen/dining area, with its soaring ceilings and beautiful furnishings and fixtures. Readers, please share with us what details in this home that found inspiring and why in the Comments below, we love reading your feedback! 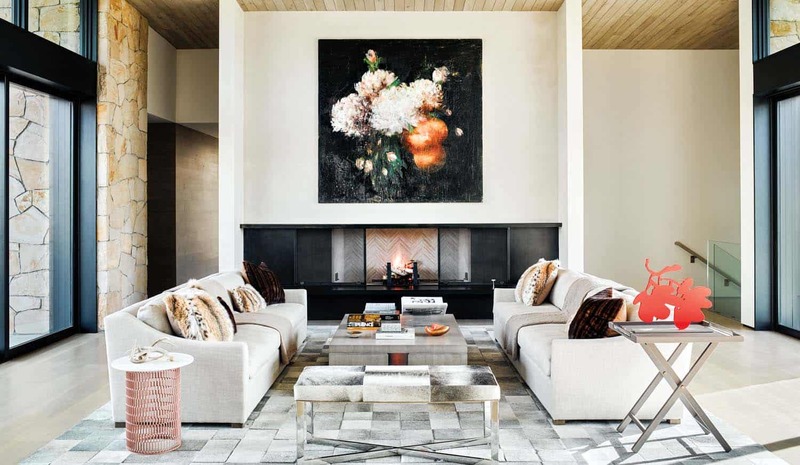 Above: A focal point over the living room fireplace is a painting by Tony Scherman. A pair of linen sofas are custom fabricated, while the cocktail table is by Holly Hunt. The bench is from Wisteria. 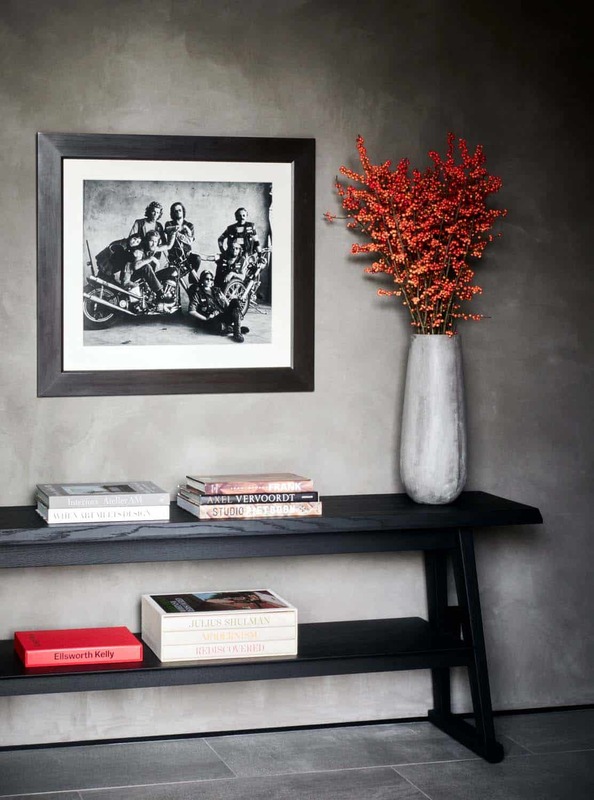 On the side table is a red flower sculpture by Donald Sultan. Grounding the space is a patchwork cowhide rug by Driscoll Robbins. 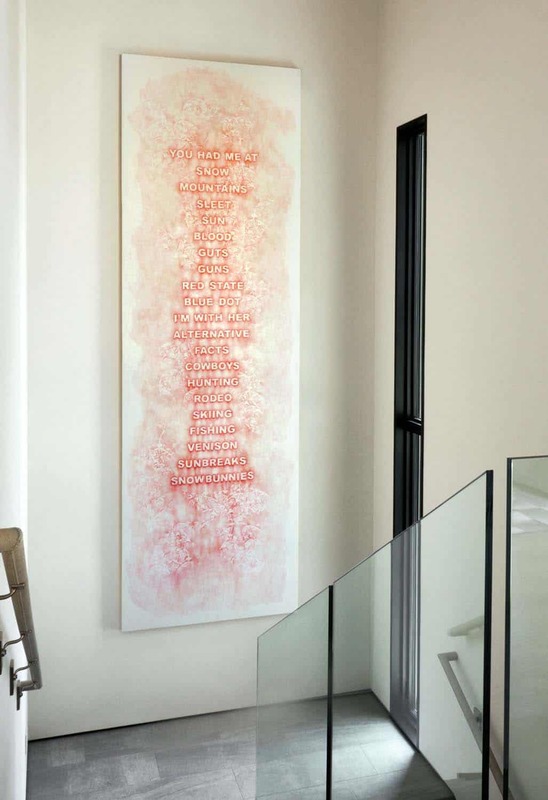 Above: Hanging in a stairwell landing is a 13-foot-high wall drawing the homeowner had commissioned by Amanda Manitach. 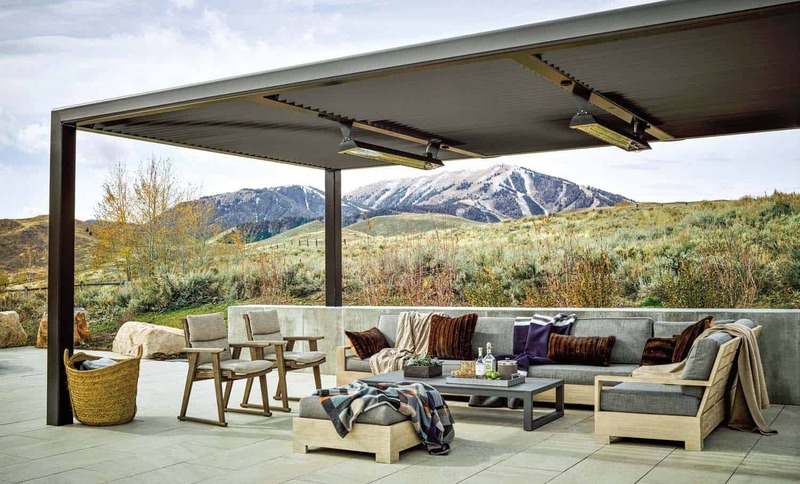 Above: A steel canopy provides shade to a terrace furnished with a sofa, ottoman, and cocktail table by Restoration Hardware. A pair of B&B Italia armchairs compliments the set, along with a vintage basket filled with throws. 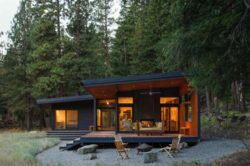 Should You Build a Single or a Double Level Home?